Between June and August 2016, the Colombian government made two announcements that will profoundly change the country. After four years of peace negotiations with the FARC guerillas, President Santos announced the Acuerdo final para la terminación del conflicto y la construcción de una paz estable y duradera [Final Peace Accord for the Conclusion of the Conflict and the Construction of Stable and Lasting Peace], moving the country toward the end of one of the longest internal conflicts in the history of the Americas. In the months prior to this announcement, the Ministerio de Ambiente y Desarrollo Sostenible [Ministry of Environment and Sustainable Development] also officially launched the Visión Amazonía 2020 Program, a low-carbon sustainable development model for the Amazon region. This program is part of the country’s commitment to reduce greenhouse gas emissions by 20 percent by the year 2030. Both announcements, linked to profound historic changes in the country, will generate new proposals related to sustainable development, agriculture, and access to land. They will also raise the question of what institutional changes are needed to effectively respond to these new challenges and opportunities. Given that the implementation of both of these initiatives will coalesce in the territories of the various rural and ethnic populations in the country, it will be necessary to directly address the crucial issue of guaranteeing indigenous and Afro-descendant communities’ collective rights. 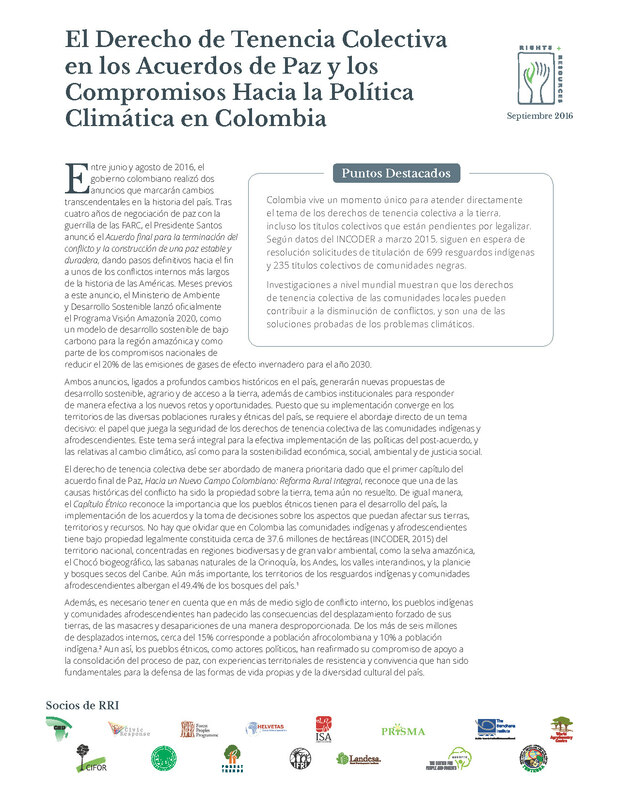 This issue will be central to effective implementation of the post-peace accord and climate policies, as well as in achieving economic, social, and environmental sustainability.